Guitar Center, the world's largest retailer of musical instruments and equipment, and DirecTV, one of the world's leading providers of digital television entertainment services, will spotlight SOUNDGARDEN in the award-winning music series Guitar Center Sessions on Sunday, May 4 on DirecTV's Audience Network (Channel 239). Guitar Center Sessions features exclusive performances and intimate, enlightening conversations conducted by revered musical tastemaker Nic Harcourt. 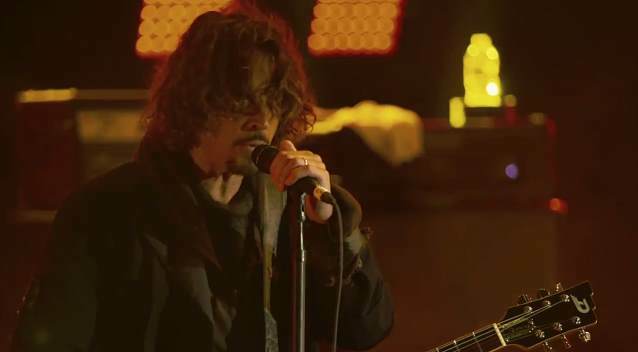 Video footage of the "My Wave" performance from SOUNDGARDEN's Guitar Center Sessions episode — which was filmed in Austin, Texas — can be seen below. "With 'Guitar Center Sessions', it all begins with the curation process. From legends like Peter Gabriel and Joe Walsh to buzzworthy up-and-comers like Gary Clark Jr. and FITZ AND THE TANTRUMS, this wide variety of musical acts creates a broad and unique musical journey simply unmatched anywhere on television," says Harcourt. "With millions of viewers tuning in each month, it is clear that there is an audience seeking the type of quality music programming that has otherwise virtually disappeared from television in the past decade," says Dustin Hinz, director of music and entertainment marketing for Guitar Center. "'Guitar Center Sessions' aims to fill that void while providing musicians with a world-class television platform that exposes their music to the masses, and inspires music enthusiasts and fans across the globe." "Guitar Center and DirecTV have created a unique venue for these artists whereby the taping of these shows takes place directly on the premises at Guitar Center in Hollywood as they create a personal and intimate experience for our customers," said Christopher Long, senior vice president of original content and production, DirecTV. "It's like a private concert and discussion that happens in your living room."